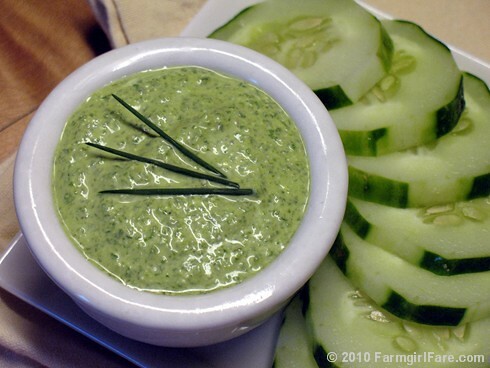 A quick and healthy green dip livened up with lemon juice and chives. Is it arugula season where you are? Is there an arugula season? Since I'm pretty sure I'm the only person in the county who grows it, I suppose that arugula season around here is whenever I have some in my kitchen garden—and that will be very soon. Arugula is a cool season, fast growing annual that has been harvested in Europe for centuries, both in gardens and from the wild. Its dark green, aromatic leaves boast a strong, peppery flavor that is both spicy and nutty. It's wonderful in salads but can be used in all sorts of other ways as well, like made into pesto or added to this scrumptious Roasted Leek and Potato Soup. A member of the brassica (cabbage) family, arugula is packed with antioxidants, high in Vitamins A and C, and a good source of calcium and Vitamin K. It has only two calories per cup and is thought to be a skin clarifier. I love the stuff. Although it's been grown in backyard gardens by the famlies of Italian immigrants for generations, arugula—which is also known as rugola, rucola, rocket, garden rocket, and rocquette—was unfamiliar to most Americans before the birth of California cuisine in the 1970s. Fortunately in many parts of the country it's now readily available at farmers' markets, in CSA boxes, and even in some supermarkets. The arugula sold at farmers' markets or grocery stores is usually just labeled 'arugula,' 'baby arugula,' or 'wild arugula,' but there are actually several varieties of it. 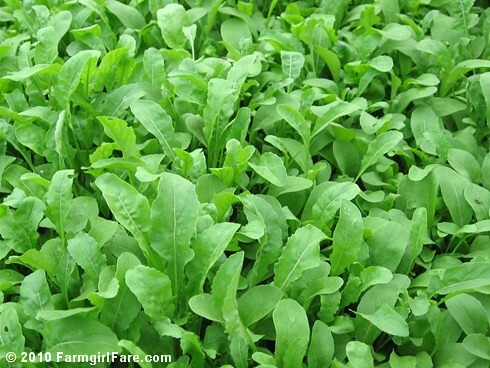 Wild arugula generally has smaller leaves and a stronger flavor, though what you find for sale isn't actually wild, but has been grown under cultivation. Some arugula has such a peppery bite that people use it more like a fresh herb, adding just a little bit to dishes. Warm weather usually intensifies arugula's flavor. Like spinach, arugula is sold in both bunches of several small plants and as loose leaves. It's also very perishable. When buying arugula, choose dark green leaves that aren't yellowing or wilted. The nicest thing about arugula is that you can quickly and easily grow it from seed, and if you let some of it bloom, it will reseed itself. Now that the end of our hottest and longest summer in years is finally in sight (I actually woke up with cold toes this morning—bliss! ), it's time for me to plant a new arugula patch. If all goes well, I'll be picking the first baby leaves in less than a month and continue harvesting into winter. You can read more about growing arugula here. 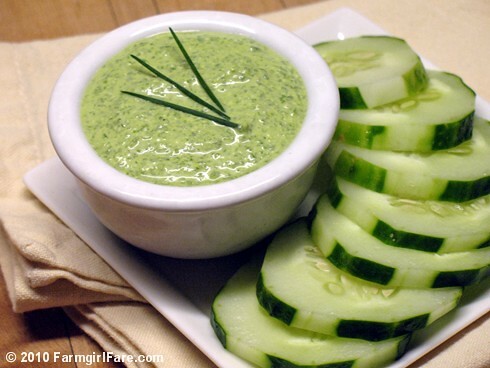 When I came up with this simple recipe last year, I wasn't sure if I would actually post it since at first glance it's pretty similar to my arugula pesto cream cheese spread (that link also includes my arugula pesto recipe, which is a tasty alternative to traditional basil pesto), and how many variations of processed arugula does anybody besides me really need? But while you can in fact use it in many of the same ways as the spread, it is definitely its own unique thing. It's hard to describe just exactly what that is (and I thought about calling it Agoopula), but after devouring half a batch with a handful of pretzels while standing at the kitchen counter scribbling down notes as to everything you could do with it, I realized it did indeed need to be shared. If you're lucky enough to be facing an arugula overflow, this recipe is an easy and refreshing way to use it up. You could also make it with watercress. Having fresh chives around is a wonderful little luxury, and they're also easy to grow. A digital kitchen scale makes it so much easier to accurately measure ingredients, especially things like greens (or basil for pesto). It's a really worthwhile investment, and once you have one you'll probably wonder how you ever lived without it. I love my 11-pound Oxo scale and often use it several times a day (the pull-out display is awesome). Place all the ingredients in the bowl of a food processor and blend until smooth (for a single batch, I use the mini bowl that fits inside my 12-cup food processor). Add more salt and pepper to taste if desired. This dip will keep for several days in the refrigerator. —Dip pretzels, pita chips (from homemade pitas perhaps? ), or a plate of crunchy carrots, cucumbers, sweet red pepper strips, Dragon Langerie beans, and radishes into it. —Use it as a salad dressing, thinned out with a little milk if desired. —Serve it on steamed broccoli, carrots, or cauliflower, or toss it with boiled new red potatoes. —Pour if over a platter of thick slices of juicy, vine-ripened tomatoes and fresh mozzarella, garnished with baby arugula leaves. —Spread it on sandwiches, adding more cottage cheese to make it thicker if desired. —Use it as a sauce for grilled chicken or fish, or even steak. —Mix it into pasta or potato salad. —Add some sour cream and stir it into mashed potatoes. © FarmgirlFare.com, the sprouting foodie farm blog where Farmgirl Susan shares recipes, stories, and photos from her crazy country life on 240 remote Missouri acres—and there can never be too much arugula. You lucky duck! My arugula went to seed in June! Looks de-lish! Must give this a try. I love arugula. It is available in all the stores here and I have grown it in the past. I didn't realize there were so many things one could do with it! I forgot how skunky arugula can taste, when I planted it in my tiny garden this Spring. Mine also grew flowers a month ago and I've been trimming them back but I still haven't eaten any of it. Thanks for these recipes because maybe I will actually DO something now! Arugula also makes great pesto. Just replace the usual basil in the recipe with arugula. My CSA gives me arugula, but if it's easy, maybe I'll give it a try. If I plant it, do you think I can trick mother nature into making it cooler here? I love arugula! I let mine go to seed last summer and it started coming up in January. We were making pesto with it by March. It was awesome! I use it in everything. Here in Brazil we love pizza with arugula (rúcula) and sundried tomatos. Yummy! Lucky you! We didn't even plant any this year--although it's my favorite part of a salad! What an unique, tasty & versatile dish! I so much love the bright green in here!